Plans to build an offshore underground gas storage facility off the Lancashire coast have gone on public display. 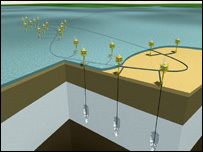 The gas would be stored in salt caverns in Morecambe Bay, 15 miles (24km) offshore from Fleetwood and 2,300ft (701m) below the Irish sea. The scheme, proposed by Gateway Storage Company, is subject to planning approval from Barrow Borough Council and the government. The plans have gone on show at the North Euston Hotel in Fleetwood. If approval is given, the facility will start operating during the winter of 2011. The exhibition is being held before the planning applications are finalised and submitted to Barrow Borough Council, the Department for Environment, Food and Rural Affairs (Defra) and the Department for Business, Enterprise and Regulatory Reform (Berr). When submitted, the planning applications will be open to formal public consultation for a period of up to three months. Gateway Storage have said it was keen to hear people's views.